Mad Money takes its viewers into the world of the Federal Reserve Bank where money is printed and eventually taken out of circulation. The cast is made up of Diane Keaton, Ted Danson, Queen Latifah, and Katie Holmes. Don has just lost his job that provides the lush lifestyle that he and Bridget were accustomed to. Rather than accepting defeat, because he couldn’t find another job, Bridget took matters into her own hands. When she took a job as a lowly janitor at the Federal Reserve Bank, the wheels in her mind started turning. She sees all this money that is being shredded and thinks it could better be put to good use in her pocket. She used the logic that since it is “trash” anyway, why not use a little to get out of debt. She cannot pull off this scheme by herself, so she enlists the help of Nina (Queen Latifah) and Jackie (Katie Holmes). Both of these women are in different departments and key to the operation. Nina has two children and is apprehensive, while Jackie is more than eager to get out of the trailer she is living in. The first robbery was a complete success and because money is the root of all evil, greed got the best of them. They go back time and time again until they have quite the nice nest egg built up. Another employee gets involved and helps out. It is not long before the Federal Reserves Bank is onto their schemes and the police are involved. The entire movie is reliving the accounts of what happened during the robberies and the events surrounding them. Though all charges were dropped against them in the police investigation, the IRS orders them to pay taxes on their money, which takes every penny they had. While they all are free to go about their lives, they are once again penniless. After nearly a year had passed, the trio meets up again to catch up on their lives. 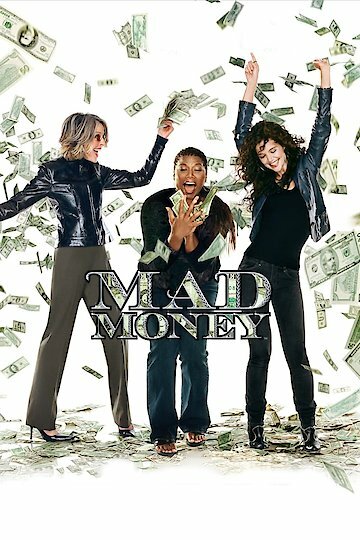 Bridget (Diane Keaton) shows the girls the "Mad Money" she had stashed in a friend's basement. The movie ends on a high note and the women still have some extra cash. Mad Money is currently available to watch free on YouTube and stream, download, buy on demand at Amazon, Vudu, Google Play, iTunes, YouTube VOD online.